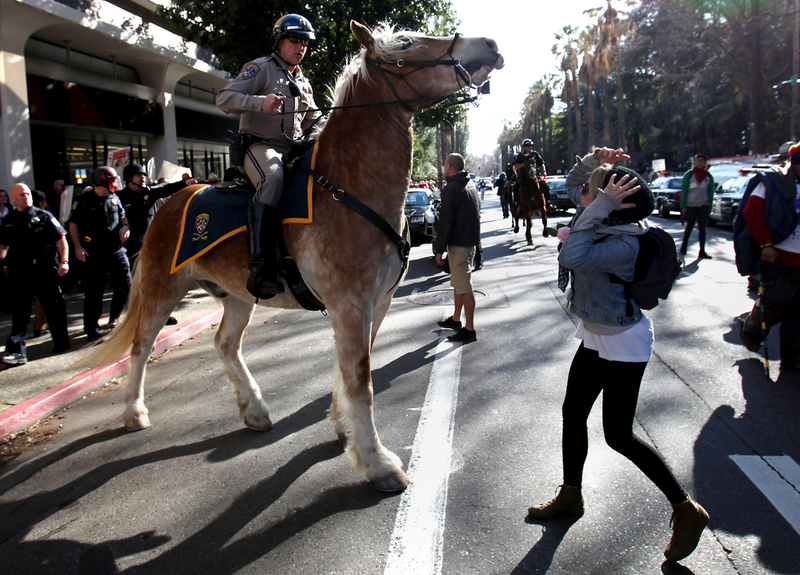 SACRAMENTO, Calif. - At least two law enforcement officers were injured Monday during a clash with members of the Occupy movement who were at the state Capitol to counter a rally by a group protesting violence by blacks against whites in South Africa. The clash erupted in the afternoon as California Highway Patrol and Sacramento police officers were escorting about 35 members of the South Africa Project to a parking garage following their protest outside the Capitol building. "It was the activists across the street engaging the officers," said CHP officer Sean Kennedy. The CHP arrested three Occupy members on suspicion of disobeying an officer. "I didn't throw anything ... but these sorts of demonstrations need to happen," he said, referring to the counter protest. "They do have the right to say what they want, but we're not going to let it fly." The public was being kept away from the scene of the confrontation by police officers, who were not commenting to reporters. The city's light rail system was stopped through the section of downtown where the clash occurred, and commuters were not allowed to leave the area.